The German cockroach (Blattella germanica) is a small species of cockroach, typically about 1.1 to 1.6 cm (0.43 to 0.63 in) long. In colour it varies from tan to almost black, and it has two dark, roughly parallel, streaks on the pronotum running anteroposteriorly from behind the head to the base of the wings. Although Blattella germanica has wings, it can barely fly, although it may glide when disturbed. Of the few species of cockroach that are domestic pests, it probably is the most widely troublesome example. It is very closely related to the Asian cockroach, and to the casual observer the two appear nearly identical and may be mistaken for each other. However, the Asian cockroach is attracted to light and can fly rather like a moth, while the German cockroach cannot. German cockroaches are omnivorous scavengers. They are attracted particularly to meats, starches, sugars and fatty foods. Where there is a shortage of foodstuffs, they may eat household items such as soap, glue and toothpaste. In famine conditions they turn cannibalistic, chewing at each other’s wings and legs. 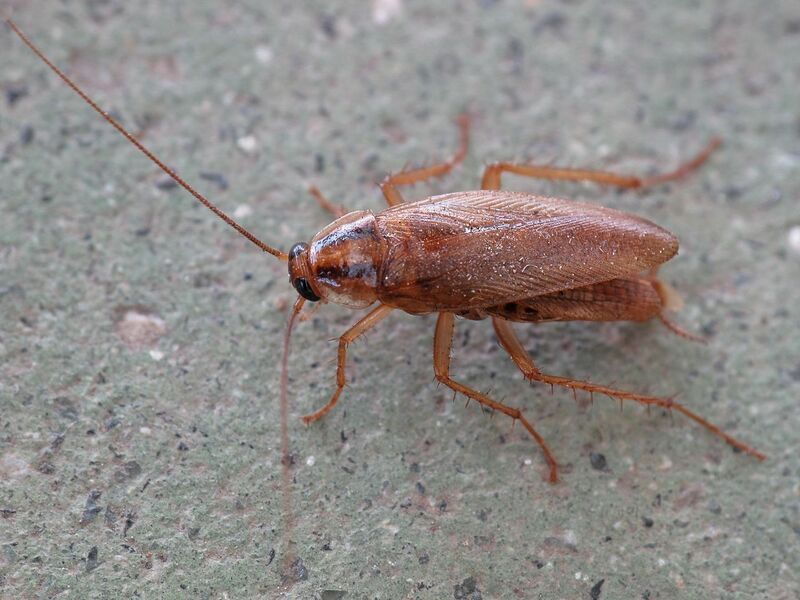 The German cockroach reproduces faster than any other residential cockroach, growing from egg to reproductive adult in approximately 50 – 60 days.